This topic started on my Facebook page. My blog and my Facebook page are my personal space. Those reading this are my friends so I am going to say what is on my heart. Some of you know; some of you may not understand this reality. Some of you will think it’s pretty unfair for me to post this. But my heart is weary and I need to put it out there. If another weary soul reads it and will feel less alone, then it is worth it (to me). If it’s the nail in the coffin of a dying friendship—what can I do. I’ve been silent long enough on this topic. After 20 years and many family hours sacrificed for ‘the game’, it’s not fun. This comes from a person who tries to be optimistic about everything. The reality is that housework, projects and chores need to be done on weeknights and especially on the weekend. I have very little help with these chores aside from loading the dishwasher and folding of ones own clean laundry. Sometimes I do that too; sometimes he does it. Keeping the house in order and somewhat clean is important to me, not to him—I deal with that. This post isn’t going to sound like a supportive, unconditionally loving wife. Let’s be honest—at a softball game my husband keeps score. If he played, I might attend to watch him play and support. But after 20 years (that’s 2 decades), even the best wife grows weary. I’ve seen several guys injured for ‘the game’ and be out of work for weeks. I’m grateful keeping score doesn’t put him at risk—aside from that ball to the eye in Kankakee a couple years ago that cost me about $1500 out of pocket (yes, me). Sometimes I’m not even home by game time. Sometimes I’m too beat to go anywhere. My daughter and I have our own interests to enjoy in our free time. 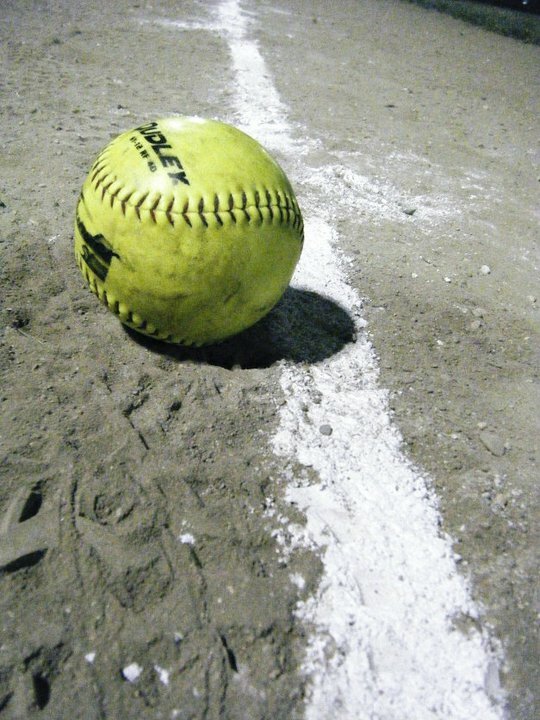 We’ve spent countless years and hours at the dusty ball field in and outside the state. We’ve been there for him in the heat and the cold and rain (delays). The conversations and language used by the guys isn’t what I want to hear, nor do I want my daughter to either. I went to a wedding with Dave recently and was personally offended by some of the talk and behavior. They thought I couldn’t hear but I was sober, they were not. It takes a lot of offend me, if that’s a gauge of what was said. There are the politics in ‘the game’—there are families that have been our friends but are now on the other bench. Broken softball relationships don’t prevent us from remaining friends. But after 20 years, I tend to guard my heart from the turnover of girlfriends and wives. My husband is self-employed—always has been. I’ve supported him and encouraged him to start his own business when he lost his job once upon a time. I am blessed to have a job that provides insurance benefits for our family and a stable income. I am blessed to have my own business to help make ends meet—that’s reality. This was my hobby but now it’s my second job and a necessary part of our household income. When I am working I have fun but my ‘hobby’ and the game softball are not to be compared. One makes money; one costs money. My fulltime job is working for a top agriculture agency in the US. Spring and summer is crazy with numerous deadlines. Although deadlines may slip on the way to my department (the production team) the event dates do not move and the deadline is solid. There is no time to make a mistake. It’s manageable but mentally taxing to keep plates spinning above my head all day. I could use support at home during this insane time of year. But it’s softball season. Why do I sound bitter? The wounds are fresh. This past weekend my extended family gathered at a celebration. I was a softball widow answering the question more than a dozen times, “Where’s Dave?” A few weekends earlier his extended family gathered for an annual cookout. Thank goodness the boys opted out of a Memorial weekend tournament. I’ve attended these parties on my own in the past—his family is our family, right? When he doesn’t make it, there is the same question, “Where’s Dave?” at his family gatherings. It hurts all the same. It hurts even more when he misses church for ‘the game’. That happened last weekend too. We separated in 2000. I was weary then too. We had a two year old and it was hard to manage everything. We counseled a few times before but this time I was tired of being the one to try to make it work—to speak up and address the issues and arrange for counsel. A few months after putting the ball in his court, I filed for divorce. You see, it was softball season and Dave’s mind was on other things and not our marriage. The guys on the team tried to tell him to take the season off. He chose not to. He had a place to move to but didn’t want to tell his dad things were rocky. I had to find a new home and listen to judgments that I abandoned our family—didn’t give Dave a chance. I made the mistake of running to someone else right away so it looked even worse from the outside. I just wanted to know love and support, but that’s another story. The fall of 2001, a year and a half later, I decided our family was more important than my personal happiness. I noticed our daughter was starting to behave in ways that wouldn’t change in a split family—they would probably get worse. I was disillusioned with the world and God was working in our lives. This is another story for another day. He is the great healer. Of course there are very special things about Dave that I love. He is a unique man and I can’t imagine life with any other person. We struggle with a 17-year age difference and two completely different upbringings. Practically every marriage has struggles. I won’t say all marriages because there are some who have learned to work with one another quite well and may be reading this blog entry with shock and awe. Shock and awe that I’m writing this? Perhaps. I guess I’m just weary of people asking me, “Where’s Dave?” Or rolling their eyes when I seem like an unsupportive wife (and they think I’m too self-absorbed to notice they roll their eyes). I could list all the things around the house and yard that I’ve patiently waited for help with for years– I’m not going to do that. My neighbors see my physical work in the yard. I see the fruits of labor. I am grateful when I do get Dave’s help but sometimes I cry because I’m so tired of doing it on my own. I am writing this just want a wee bit of understanding as to why the game of softball is not an interest for my daughter and I. She doesn’t care for the game either—sharing time together is her love language. Her dad refuses to coach her spring basketball games for a few weeks, a few nights because he’s too busy. And yet she sees him making an early game and staying out with the boys a couple nights a week from spring into late summer. The reality is that Dave and I resurrected our marriage, but he never stopped seeing his mistress. I was wrong to assume his interest would eventually wane. It’s not just a game to me. It represents so much more. I’ll continue to plan our date nights and family outings, cherishing the times we do have together. But forgive me for not being excited for ‘the game’. It happens every spring… I should be used to it. After 20 years, I still long to be with my husband more and more. I hope we will have 20 more years together but without regrets for the times we missed out. I know our only child will be grown and gone in a few years. For this moment in time I want to hang out together doing the things we enjoy. This wasn’t meant to be a personal attack on Dave or the guys. It is merely a personal defense to the repeated question, “Where’s Dave?” Women laugh when they want to cry but this joke has gotten way too old. I can no longer politely decline invitations to ‘join the fun’. The fun ended many years ago.